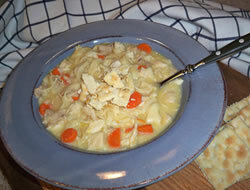 This creamy chicken soup will become one of your favorite comfort foods to warm you up on those cold winter days. 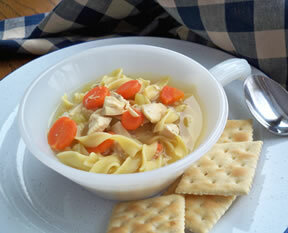 You will love the creamy broth of this tasty chicken soup. 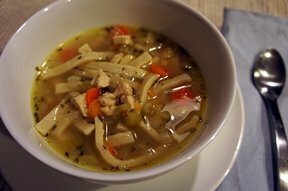 Cook the chicken first to create soup stock. Heat chicken stock and bouillon together. Add carrots, celery and onions; simmer until veggies are tender. Add can soup, sour cream, and milk. Add cooked chicken and noodles. Add salt pepper to taste. 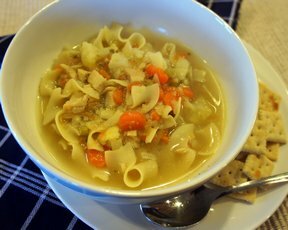 "I have made a lot of homemade chicken noodle soup but had never tried a creamy one. I used this recipe to give it a try and we really liked it. It was definitely worth making again."